Russia has raised fresh concerns over chemical arms in possession of Syrian rebels and has stressed on the urgent need for all chemical weapons in Syria to be destroyed. Lavrov conveyed the Russian position to US Secretary of State John Kerry on the sidelines of the UN General Assembly in New York early on Wednesday. “There are serious concerns that the opposition might possess separate components of those harmful substances,” he said. 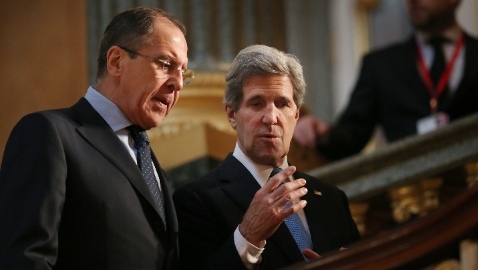 Lavrov said Russia and the United States share a common approach to what should be done in the future. “The talks were productive, we have a common understanding of what should be done next, and that it should be done on the basis of the framework agreement reached in Geneva,” Lavrov said. Washington and Moscow differ greatly on the terms of a Security Council resolution that would enforce Syria’s compliance with a US-Russian plan for the Syrian government to hand over its chemical arsenal. Russia has said military threats cannot be part of the resolution. He gave no specific date when asked when the resolution is to be passed, saying that the work on it is under way. The UN has announced that its chemical weapons inspectors will return to Syria on Wednesday to complete the probe.